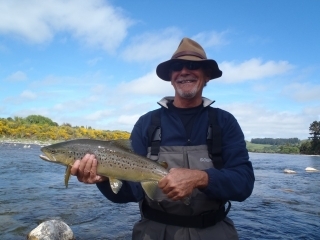 Hey guys, It has been one very wet week for me and anyone else which have been on the rivers or trying to enjoy the NZ summer. The coats, waders and favourite under garments certainly have not hadÂ Â a chance to dry as the weather has been damp, drizzly or chucking it down with rain. The rivers have all risen with all this rain and it was only with last minute planning and flexible clients that I have been able to complete four days this week. Currently it is Sunday morning and I am laying in bed listening to the rain which has been pouring down all night so I will expect local rivers such as the Tongariro to be on their way up and dirty for the next few days. I have also learnt I don’t have to go to church every Sunday morning as every channel on TVÂ has coverage.Â During the week I passed over the TT bridge several times and it was very high and dirty with no sign of coming down or clearing so this fishery will not be an option for a few days. It is a tough old time of year at the moment an anglers are reporting some real mixed bag of both results and quality of the fish when they are catching a few. Rainbows nearly all seem to be small if they are fresh and the larger fish seem to be recovering trout or still very skinny after spawning. 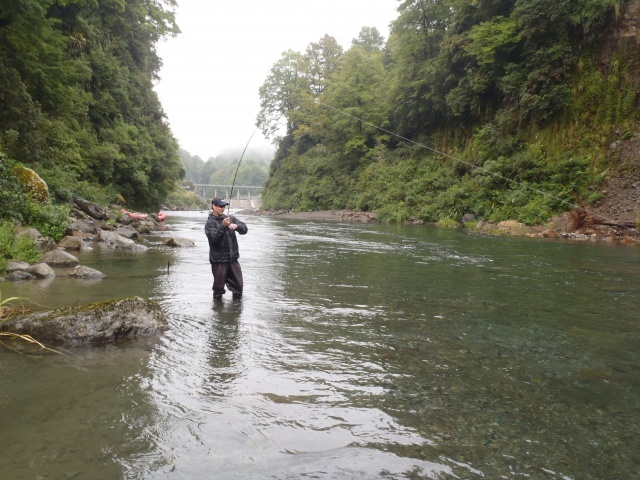 The best numbers of tout coming from the Tongariro’s evening rise which seems to be popular with anglers purely for the sport but not so much for quality trout. I would assume this week that the evening rise may have been stunted slightly due to the rain and cool breeze blowing in the evenings and should take off gain when this patch of weather passes. 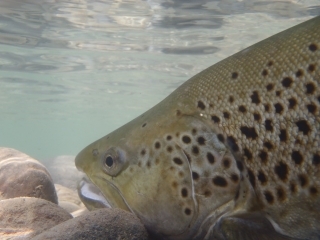 TheÂ big Brown trout I think are slightly behind last season as I had already seen some amazing fish this time last year high in the river and may have even caught one or two, cant quite recall. There are a few showing up from day to day but the bulk of them seem to have not entered yet or are still in the lower section at the end of Graces Rd. I think I said before thatÂ I had been down for a look on a still bright day and really did’nt see any which would have been over 5lb so hopefully the big boysÂ are running slightly later this season and together. 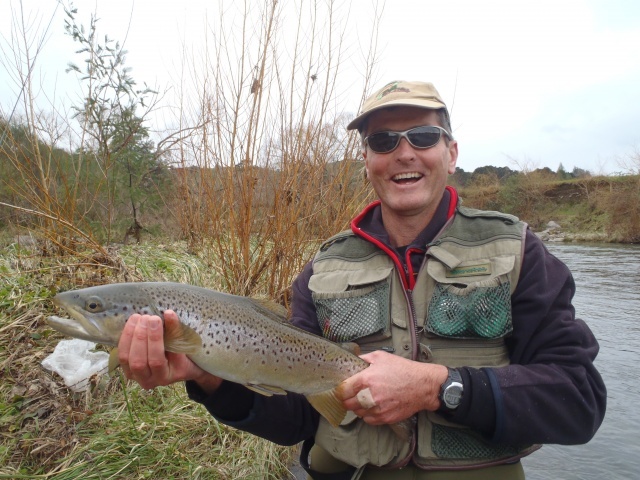 The introductionÂ of these trout add some excitement t the fishery for meÂ and are fish that I will target while out fishing by myself or mates. The rise in the rivers should pull a few of these fish up into the town pools and I will expect to see a picture posted somewhere this week. The back country this week was quite good while we could get out there and with the use of the raft we were able to pop into little backwaters which are very hard to get at usually which thankfully produced fish. The rain did blow these rivers out on Thursday and I would bet they have not cleared yet and will be up for a fewÂ days yet. ItÂ is not a bad thing and shouldÂ actually make the fishing betterÂ or at least reserve the fishing for the Christmas period for anglers. The Whanagnui was the pick of the rivers with most reasonable trout being in the 2-4lb range and a couple of smaller pretty browns capping of a good couple of days. The rafting on the upper section of the TongariroÂ I have to report regrettably as being really quiet compared to other years. We are seeing fish in the top section especially in the first few pools but theyÂ are holding in really quiet water which is gin clear and spook with every cast so things have been really tough. I suppose that a few things have been racing around in myÂ head trying to figure out why things are so slim up there but with no evidence to base anything on I better keep it shutt. It will be interesting to know how DOC have one with the trap this season and how many fish have been recorded going through here this should give a better idea on numbers anyway-maybe I just cant catch them?.Â In saying that we still caught a few fish and clients were happy with the overall experience whichÂ is what is most important, quite often fishing guides will loose sight of the big picture and concentrate on fish numbers but that’s not always what is important, that’s what I’m sticking to anyway!. Looks like this rain might be about for a few days and anglers may have to look further for some clear water to fish but the rivers should be in good condition once they start to drop and hopefully holding some new fresh larger trout. If the wind stays away this will also be a good opportunity to sneak about the edges of a river mouth especially the Waitahanui.